Business lexicon regularly appropriates phrases from other, more colorful pursuits. Sports (“home runs”, “level playing fields” et al) spring to mind, but military terminology is regularly leaned upon too. Indeed, the Art of War by Sun Tzu is often cited as the first written example of business strategy, albeit juxtaposed from ancient military teachings. Any kind of debate is healthy, therefore in this article, I will explore what economic moats are and how they can be constructed. Followed by a discussion on the contrasting opinions of Buffett and Musk. The core differentiator of a moat, over a competitive advantage, is that the business has something that is sustainable. A moat is long-term, while a competitive advantage can merely be an opportunistic window of time within the journey of a business. I will get onto what types of moats exist, but in terms of common financial characteristics that define a business with a moat, they are largely businesses that are cash rich with strong returns. Such moat-y tendencies translate to sustained levels of high free cash flow and a positive return on invested capital (“ROIC”) less weighted average cost of capital (“WACC”). The presence of the former shows that the business is generating cash, which it can use to reinforce its moat and the latter demonstrates that it’s putting money to work in an effective manner over its peers. Morningstar is a preeminent leader in the moat think space and it even has created an index comprised of a basket of moat stocks. As expected, an ETF that replicates this group of premier companies has outperformed the S&P 500 over a sustained period. Interestingly enough, the most common sector within the Moat index is health care. As a complex industry in itself, with many efforts (notwithstanding some misguided) in place to disrupt it, health strategy would warrant a whole series of articles. But when you read the proceeding section on intangible assets, you will see how moats can be powerfully built inside healthcare. Being able to produce at low prices will allow a company to outperform its competitors. This serves to allow the producer to capture more margin, or by earning more market share through attractive pricing. In “commodity” industries, this is the most critical moat to build, as customers are largely going to be agnostic towards the business if the end product/service has a degree of homogeneity. Cellular phones have moved towards such characteristics. Years ago, a phone would be defined by the unique features and aesthetics that each OEM would offer. Now, with phone hardware performance being largely undifferentiated, it’s the operating system inside that matters, and only large OEMs (that aren’t Google or Apple) can compete. Not even the original creator of Android himself, Andy Rubin, could overcome these odds, with his new phone manufacturer Essential spending over $100m in 2017 on development, to see sales barely move the needle. Generally, a low-cost advantage comes from having large scale, where bulk-buying and automation drive down overhead. Yet it’s also an advantage that comes from earned process experience and at times, seizing upon geographical, or cost of capital arbitrages. The airline industry shows a tangible example, take Etihad, Emirates and Qatar Airways, three Middle Eastern Airlines that have grown in huge prominence over recent years. Their capital costs are lower than pure-private airlines due to government subsidies (over $42 billion since 2004) and their geographic location provides an excellent cost advantage for en-masse hub-and-spoke long-haul. It can appear more elegant and organized to have full vertical integration. But within the laws of comparative advantage, if someone else can do the job better and cheaper, you should outsource to them. Full visibility of your supply chain and a robust cost accounting system should make such opportunities appear apparent. Often, with startups in particular, there is an ambition to take on everything. This leads to a generalist approach, that neither excels in anything nor provides scale cost advantage. Become an absolute master in one focus area, then use that playbook once success is proven. Now established mainstays of business curricula, when originally introduced to the wider world, Japanese organization principles opened up whole new ways of thinking about management. Kaizen (improvement) and Kanban (delivery) are two examples that emphasize ‘continual’, in terms of small changes or steps, that both over time create more cost-effective processes. The harder it is for a customer to switch to a rival offering, the deeper the moat that is created around the incumbent. Such a cost is defined by a combination of both the price, inconvenience, risk and time required to move platforms. This kind of buyer lock-in serves as a moat because it increases the lifetime value of a customer, thus building up a unit economics advantage that restricts competition from stealing them. When the concept of switching costs is discussed, it’s often framed around poor customer experience. For example, the hoops required to leave a utility contract, switch banks or enterprise IT infrastructure. Switching costs are an interesting topic these days because, in my opinion, there has been an improvement in alignment towards the consumer. Advances in technology now make it easier for a consumer to switch, for example: the termination of a physical mainframe contract is far more arduous than switching to Amazon Web Services. Yet, the switching costs have become exogenous on the part of consumers, as their data and behavior patterns, increase their earned utility, which keeps them on the service at their own will. Take, for example, a customer of Netflix contemplating a move to Hulu. Physically, there is no switching cost, but they would sacrifice years of behavior pattern matching that manifest in the tailored recommendations from the machine learning outputs Netflix provides. Switching costs have almost now become “data moats”. Switching costs also represent the most on-trend topic for economic moats at the moment. Regulatory moves such as Open Banking and GDPR are in their essence, initiatives to liberalize the portability of data. Go the hard way and build your own platform, instead of layering on top of another. Owning your own data will provide more flexibility, insight, and protection from risks. This is a reason why a range of tech companies are engaged in the duplicate activity of mapping roads, it’s to ensure that they own their own data and don’t go the same way as businesses like Meerkat. As Erik Stettler wrote recently: “information is the world’s most valuable commodity, but it is less often mentioned that data is not information”. You need the power to collect insights of what people are doing and enjoying, but also to understand why, and then double down on them. You’ve seen the generic mailing list “why did you unsubscribe” popup, or even had the damp exit interview when you leave a job. At times they seem like a means to an end. Don’t be afraid to celebrate the insight of understanding and putting steps in to resolve a reason why a client was lost. One of the most popular business buzzwords of current times is the concept of network effects, which is often misused and misinterpreted. 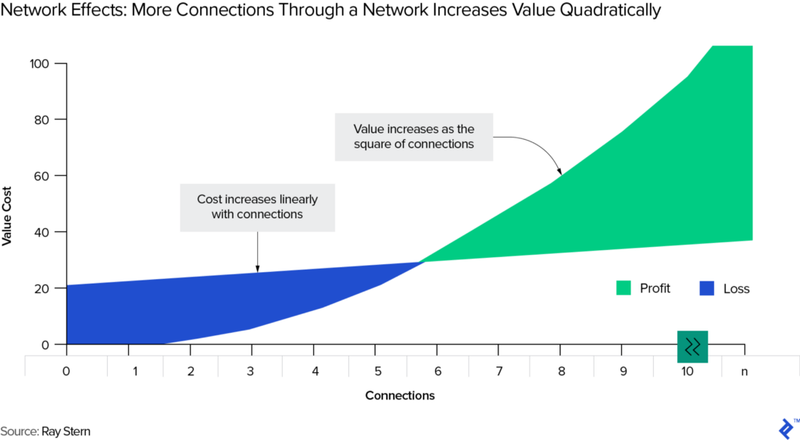 In its simplest form, a business has network effects when its users gain more value as the numbers of users in the ecosystem increase. It signals that users have mutual compatibility and derive increasing value from it. As the facilitator of this, the business is creating value for itself and others. As an economic moat, such a situation is nirvana. Aggregator and platform type businesses especially seek to create network effects. The rise of social networks and on-demand business models brought the term into more prominence, but they have been always been around, think: hobby clubs, phone switchboards, and old-fashioned town markets. 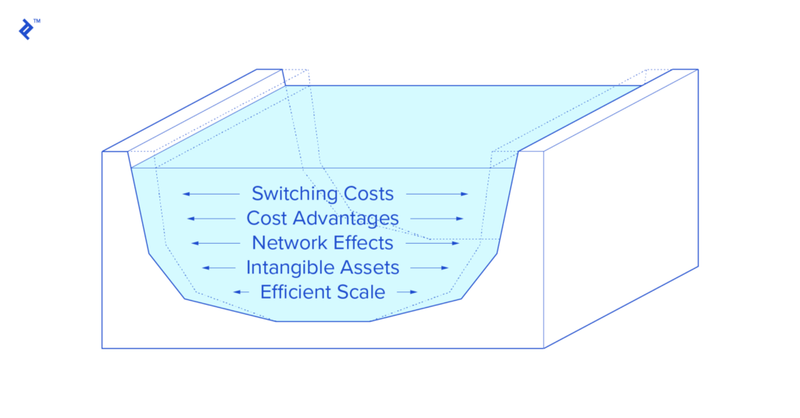 Why network effects are moats can be explained when you look at the effect of value and cost as users increase. There is a marginal cost for the facilitator, which assuming a reasonable level of scale, will barely rise as more users are added, but the value generated rises quadratically. This value rises as the effect of more users stimulates more transactions and utility for them. Quicker wait times for an Uber, more selections of antiques in eBay, or electric scooters even closer to your house door. This natural convenience is impossible for newcomers to replicate with finite resources. Ben Thompson says Microsoft’s platform is so popular because the wider ecosystem earns more value from it than Microsoft does. The tendency when you have a good thing going on is to raise prices or create more rules. Refrain from this and let the network effects form, but then encourage them. Amazon knows that some buyers may revert to the reseller’s website for a slight discount, or that Airbnb guests will pay for some extra nights in cash. In the grand scheme of things, such slippage is negligible, and both buyer and seller will be back on the platform next time. No one wants to be the first one to a party, which gives rise to the chicken and egg dilemma of network effects and platforms. Take time to understand the dynamics of potential users of the network and find who has the least to “lose” by going first. A driver on a rideshare service or a seller on an auction site only needs to invest a passive interest to go live on the platform. Compared to the buyer being terminally put off from returning to a service, if it sees no liquidity. Find the first mover and encourage them with benefits, either monetarily or informationally (e.g. community or curation). A clear way to build economic moats around a business is to have a differentiator that is impossible to replicate, either due to legal means, or factors that aren’t fungible. Intangible assets constitute patents and trademarks, but also hard-earned competitive advantages, such as brand names and culture. Patents and trademarks provide a differentiator and customer stickiness, this, in turn, leads to more inelastic demand characteristics. These tactics are the bedrock of industries such as hardware and pharmaceuticals, which invest significantly in R&D. Brand name and corporate culture are not as easily “manufactured”, but once in place can be impenetrable for upstarts. The cache of a brand allows for pricing and trust advantages that draw and retain customers. An effective corporate culture also ensures that productivity is high and in a virtuous cycle, attracts the best talent to come and work there. In a business context, though, this only matters if you can then improve upon the service, which as numbers show, Instagram is currently winning at. Stimulate PR, don’t try to manufacture it. Virality occurs from serendipity and if something is good, people will certainly find out about it. Likewise, journalists want to report the news, give them an angle, not a memo from your intranet homepage. IP can be notoriously difficult to protect across borders, but innovating not only gives you a first mover advantage, but also creates a halo around the business. Employees want to work for innovative companies, consumers are inspired by stories of creation, and that’s one way to create a brand. Despite the title suggesting another contemporary buzzword, efficient scale is probably the most “classic” of the economic moats. It refers to when natural monopolies exist that allow companies to serve consumers well due to their sheer scale, which in turn deters new entrants. Oftentimes this market is limited in its absolute size, due to geography and regulation. That is why utilities like airports, railways, energy, and infrastructure are often described as industries allowing for efficient scale moats. Build a new airport in a mid-market city and it’s a zero-sum game — flyer numbers won’t double overnight. For other industries without “utility” tendencies, M&A and consolidation are key plays for obtaining efficient scale. A few years back, the ridesharing industry appeared to be on a race to the bottom. Cloned variations of the major apps would appear in different markets and the constant marketing needed to retain eyes sustained aggressive price promotions. Nowadays the arms race is more subdued, due in part to geographic consolidation by Uber, Didi Chuxing, and Ola. This is in an effort to build efficient scale across their respective core markets, by acknowledging that there may be a finite ceiling of customers that can be efficiently serviced long-term. Time will tell whether these consolidation moves benefit, or harm the consumer. ….Do Economic Moats Still Matter Then? A moat is deemed to exist if a business has a sustainable competitive advantage, essentially that it keeps the status quo ticking along. This does, however, draw perilous parallels to Clayton Christensen’s theories on disruptive innovation. Whereby incumbents that specialize in sustaining innovation are eventually toppled by newcomers that serve a fringe group of the market before seizing the whole market. Musk’s argument touches on this concept and an overriding narrative of business in the past decade, the “David vs. Goliath” story that it is possible to use technology to tackle a large behemoth and turn an industry on its head. Musk himself has, of course, played a part in changing the course of the payments and automobile industries. People also may confuse moats with monopolies (the bad ones) and for that, they may be seen as an un-aspirational, slovenly state of greed. Economic moats though are not monopolies and as some examples in this article show, at times they are indeed aligned with consumer benefit. Yet whether moats are “lame” is really more down to your own management style. To come back full circle and transpose business with other walks of life, in soccer, there have been many winning teams built on a rock of an organized defense, yet with a dull and agricultural approach to attacking. The flip side is the many winning teams that have followed a beautiful attacking philosophy, compromised by kamikaze defending. So, whether it’s Greece from 2004 or Brazil in 1970, does it matter how they played, if both were winners? Whether you wish to attack or defend the castle, is purely down to your business style. Yet one thing is certain, once you own the castle, you most likely will want to remain there, which is why economic moats will always matter. Do Economic Moats Still Matter? was originally published in Toptal Publications on Medium, where people are continuing the conversation by highlighting and responding to this story.